Ponca camp. Photograph by F. A. Rinehart, 1898 © Omaha Public Library. Public domain. To understand the context of the Ponca migration which started as a great Degiha group migration, you may want to read the according article first: Degiha tribes migration. The following recount is mainly based on information from Ritter (2002). 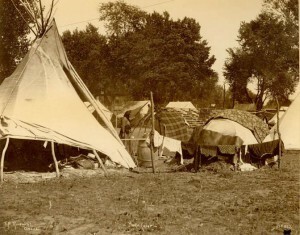 Concurring accounts relate that during the migration of the Degiha tribes, after the Omaha and Ponca separated from the Osage and the Kansa at the Osage River mouth and crossed the Missouri to the north, and after an intermediate but longer layover where they hunted bisons, they continued further north to the sacred pipestone quarries (today Pipestone National Monument, Minnesota). Enroute, probably around the Des Moines River, the Ioway people joined them. But there the tribes experienced heavy resistance by the Dakota and were forced to abandon their settlement, after which they drifted south-west to the Big Sioux River, a good environment with plenty of game. However there too they experienced resistance, this time by the Yankton Dakota an their allies. In a major battle the Omaha and Ponca reportedly lost around 1000 warriors. Obviously crushed, the three tribes moved to Lake Andes in south-eastern South Dakota. Estimates by historians locate this sometime near the year 1684. This appears "consistent with available ethnographic, ethnohistoric, and archeological data" (Ritter 2002: 276). Later, the Omaha and Ponca returned to the Big Sioux River, where during their renewed settlement there, they again had to fight a fierce battle with the Yankton Dakota. Here they also came into contact with the Arikara whom they repeatedly harassed and finally drove them north (historians however generally credit the Yankton and Santee Dakota for the displacement of the Arikara). "After finally abandoning the Big Sioux village locale, the confederated tribes traveled west and northwest to the mouth of the White River, where the Omaha and Ioway remained for a time. The Ponca, however, set off on their own to the Black Hills. The three tribes eventually reunited and traveled back down the Missouri River. Driving the Arikara out of northeastern Nebraska cleared the way for the eventual settlement of the region by the Ponca, Omaha, and Ioway (...). Around this time the generally more mobile Ponca received their first horses from the Padouca (or Plains Apache). There is no oral history of how and when the Omaha received horses. This entry was posted in Geographic distribution, Migration, Omaha, Ponca and tagged history, horses, migration. Bookmark the permalink.